Totally sensational start of 40th edition of Rally Dakar for MKR Technology: The Renault Sherpa of the Dutch Martin van den Brink finished second in the first stage on Saturday. The Czech Aleš Loprais with his Tatra prototype won the stage with a gap of twenty seconds. 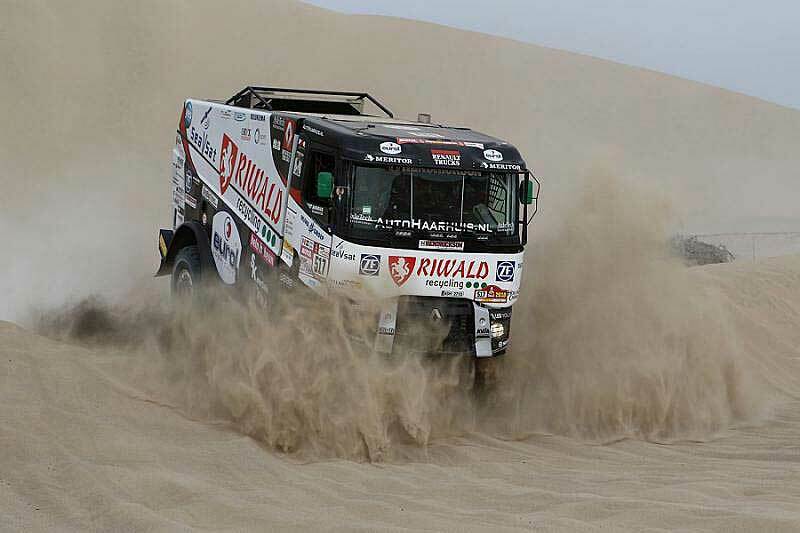 The other two Renault trucks of the team took the 13th (Gert Huzink, Riwald Dakar Team) and 19th place (Van Kasteren, Mammoet Rallysport). “After ceremonial start in Lima we took a really boring essential two hundred and fifty kilometers long transfer to timed special section. Special section had just thirty kilometers, but it was hard anyway," said Daniel Kozlovský, Czech mechanic in the Renault Truck. "Martin did well, so it is a great start!" First of fourteen stages after ceremonial start in Peruvian Lima took all the teams into finish town of Pisco. The last thirty kilometers of timed section were in sand and the teams had to fight dunes right away. Czech driver Aleš Loprais tackled them best in twenty five minutes. Dutch-Czech team with van den Brink and Kozlovský on Renault truck lost exactly twenty two seconds. Russian Nikolaev (Kamaz) took the third place.